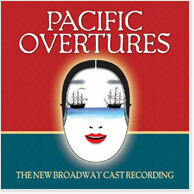 Spanning 150 years, the Tony Award-winning PACIFIC OVERTURES by Stephen Sondheim and John Weidman tells the story of Commodore Matthew Perry's arrival in the "Floating Kingdom" of Nippon in 1853. B.D. Wong stars in the 2004 Roundabout Theatre Company revival, along with Eric Bondoc, Michael J. Bulatao, Evan D'Angeles, Rick Edinger, Joseph Anthony Foronda, Yoko Fumoto, Alvin Y. F. Ing, Fred Isozaki, Francis Jue, Darren Lee, Michael K. Lee, Ming Lee, Telly Leung, Orville Mendoza, Paolo Montalban, Alan Muraoka, Mayumi Omagari, Daniel Jay Park, Hazel Anne Raymundo, Sab Shimono, Yuka Takara, Kim Varhola and Scott Watanabe. The 18-track CD clocks in at 79 minutes and 22 seconds, and includes a bonus track from a reading of the original production, in which Stephen Sondheim and Harold Prince perform a cut song called "Prayers." "Kayama Yesaemon. A samurai, but one of little consequence." "Disaster! The Americans insist upon landing." "My Lord Governor of Uraga..."
"Whatever happened inside the treaty house..."